The Projectum Teams 2 Project app interface. Let’s start with an obvious question you could be struggling with: Why do I care for this app? 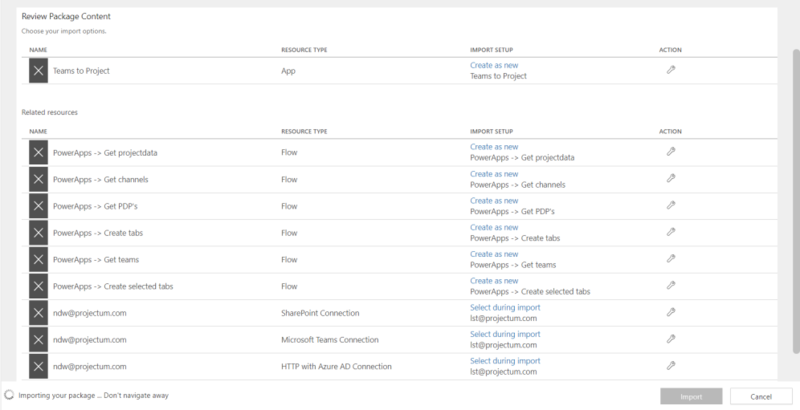 The current Microsoft Teams and Project Online applications aren’t connected in any way. If you want to share a schedule or any part of a Project Web App with your team members you would either do this through the Project Online screens or you would create a website tab per page manually. This could take you a long time, and you would need to do that for each project and for each tab that you want to include. Let’s for instance say you are part of the Marketing department. The department uses Project Online to manage all the marketing events and they have a Teams Team (still not sure if this is the right name to go for) to collaborate and share files. The department wants to create separate channels for each event, getting the right people to collaborate without messing up the general chatter that goes on on their team. With 3 project managers on the team, and 20 projects in total running at every given time, this is a time consuming effort. And there’s one project manager that’s not too IT savvy so he always forgets to put the important elements in the channel. Teams 2 Project, or Teams to Project as it’s also called, can take a lot of this manual actions of your hands. It makes it super easy for Project Managers to create a new channel and include all the essential content from Project Online. You can watch a very short video on how the app works below or here if the embedded video doesn’t load. This was a very short intro video. I have my own YouTube channel now, so you can be sure that I’ll include a video of my own with more in depth content on the app. Contents of the app package. Now don’t let above image scare you. Most of the actions required to get the app working at your organization are easy. 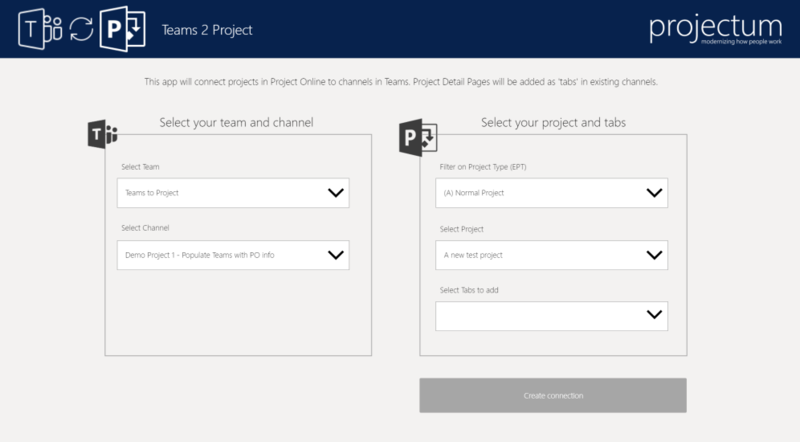 But it is a requirement to have all users that will interact with the App to be Project Online Professional / Premium, PowerApps and Flow licenses. The app consists of the PowerApp, 6 Flows and 3 connectors. The PowerApp is used for the visualization and gathering all the user input. The Flow’s either get data or create channels and tabs. The 3 connectors are required to make sure the right person is able to sign on to the environments. Once the app is created in your environment you can add the app in your Teams Team and make use of it. This can be done by creating a new Website tab and using a special link that you need to create for your organization. Now that you have the technical documentation, let’s get the App itself as well. Head on over to this link, and download the App files. If you are not an IT minded person, or if you just want someone else to take care of this hunt down your PowerApps Admin guy /girl and let that person take care of the app installation. Although, with the documentation I think that anyone could install it. So, keep an eye out for more information on the App, and I’ll update this post as soon as I’ve uploaded my installation struggles. Also, have a look at Peters post with more screenshots and instructions. I’ll put my money where my mouth is in a new video that I’ll work on, right after I get back from the Project Conference in Kiev. I’m excited to be there, I’m the first ever Dutch guy to be a speaker and I even have 2 presentations! It’s a great time to be alive, to quote one of my favorite YouTubers :-). Update: here is the video of me installing the app.